Here are the things we did yesterday. I was not able to post it last night because I was too tired already.We went to SM Cagayan de Oro. 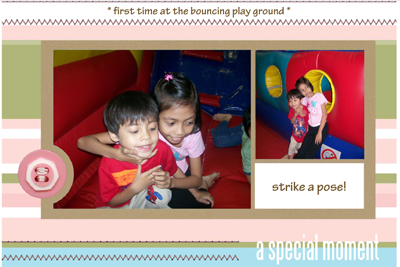 The first thing we did was to let the children try the Jump, Bounce n’ Play Interactive Inflatable Playground. They have been wanting to try it. So,yesterday, they got their chance and they were very happy bouncing!! Afterwards, we ate at Pizza Hut! Our favorite place obviously. LOL!! 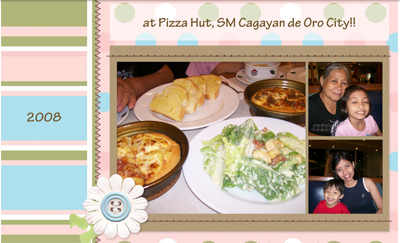 We enjoyed the pizza, the chicken meal, and my Ceasar’s Salad (I am not on a diet, just like eating fresh vegatables). Of course, that beautiful lady is my mom. I brought her along because our last date was last month when we watched Mamma Mia together. Then later, after eating a delicious meal, we went to National Bookstore and purchased their favorites: coloring and activity books. 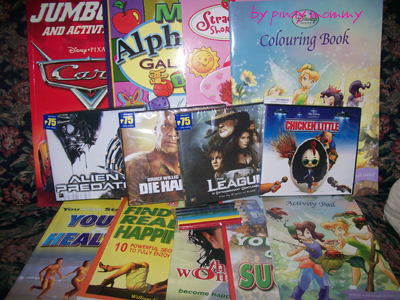 We also bought some original movie CDs to watch and some self-help books for me. Then went to the groceries. It was a day well spent and we all glad we did went out. We all deserve a break!! Digital Scrapping Credits, Click HERE. Now this is what I’m talking about….going out and spending time together. You deserve to do that more often. I can see the happiness in your kids’ faces. You’re lookin’ good to Mommy Ruby…hawt is the word…. mommy sarap sa food! hope you had fun!